Wow! It's been over 3 months since Grace turned one. I just can't believe that in just a couple of months, she will be a year and a half! Time is moving way too fast for me! In the past 3 months, I've posted about other aspects of Grace's birthday. 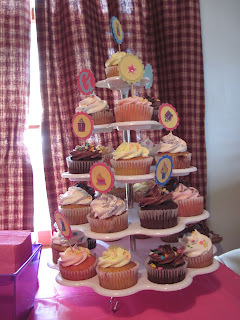 I told you about the cupcakes that my niece decorated for her party. 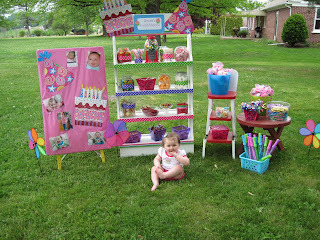 I showed you the Sweet Shoppe that I created for her party from a yard sale shelving unit. 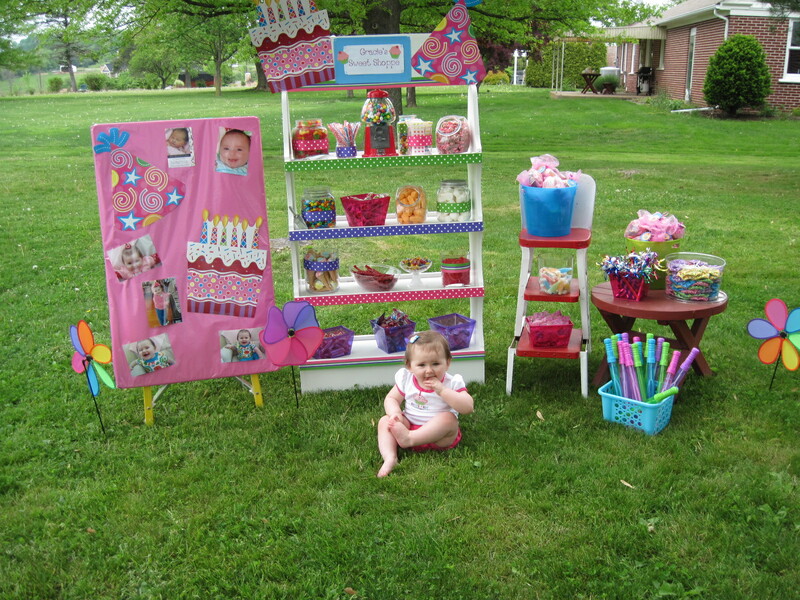 Click on the link above to see more photos of the Candy Buffet. It was a huge hit with both the kids and the adults! Today, I want to tell you about the invitations I made for her party. Even though we were planning a small party for Grace, I still wanted her invitations to be special. I saw so many great options online. But all were priced higher than what I wanted to spend. I decided to go downstairs and check out my abandoned craft room to see what I had that I could use. After seeing that I was low on cardstock and didn't have enough to do one color scheme, I decided to go with an assortment of different colors. I purchased a Fiskars Squeeze Punch (Something Old, Something New) on sale at Joann Fabric and I used that for the corners. And instead of buying stickers or other embellishments, I dug out my out-dated Sizzix machine (I was really hoping to buy a Cricut Expression but couldn't fit it into our budget at the time....sigh...someday) and used the cupcake die cutter to cut out a bunch of cute little cupcakes. 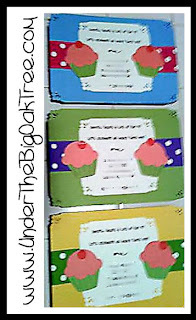 In the end, I only had to purchase the corner punch and the adhesive to put the invitations together. And even with those two purchases, the cost was still much less than the custom invitations that I wanted to purchase. My only regret is that I didn't get a better picture of them. I was a bit late in getting them done and needed to get them in the mail. The picture posted above is from my camera phone, taken just before I stuffed them into envelopes to mail out. Very cute. I've always said a great invitation sets the tone for a fabulous party and it looks like yours was a success! awww! 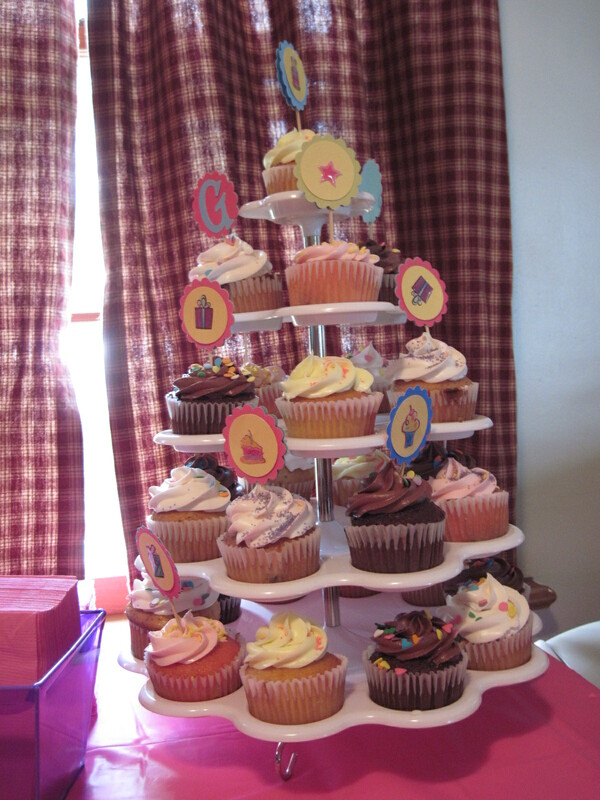 The candy cupcake theme is so cute! I love the Sweet Shoppe! You're so creative and everyone must have loved it! Cute party and great invites! Those are such pretty invitations. What a lovely idea! Simply ADORABLE!!! Thank you so much for linking your wonderful creation up at Frou Frou Decor today!! Have a great weekend!